Part of my new SQL 2012 TSQL features series is a look at the new FORMAT function. 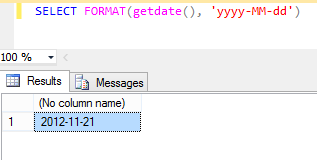 This function can be used to format date/time and number values as strings. Almost all SQL developers will come across wanting to use SQL to format their dates in a specific way or make numbers more presentable. It has a very simple syntax and does pretty much exactly what you'd hope. See the documents online for more usage examples. 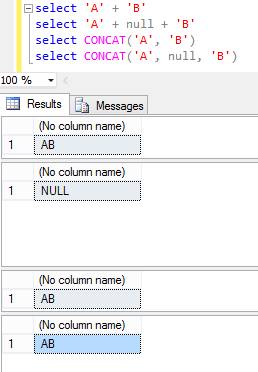 Part of my new SQL 2012 TSQL features series is a look at the new CONCAT function. CONCAT takes a variable number of string arguments and concatenates them into a single string. It requires a minimum of two input values; otherwise, an error is raised. All arguments are implicitly converted to string types and then concatenated. Null values are implicitly converted to an empty string. If all the arguments are null, an empty string of type varchar(1) is returned. The implicit conversion to strings follows the existing rules for data type conversions. This means it's now possible to easily concatenate strings without worrying about fields being null. Previously if you used a field that was null when adding strings together it would have resulted in a total null string. This meant using some custom logic to deal with the null, like the following.